Individuals learn the ‘what’ and ‘why’ with Foundation, but the two-day ITIL Practitioner classroom course will give you the ‘how' and will fully prepare you for the ITIL Practitioner examination. ITIL Practitioner prepares individuals for a broad range of challenges faced within ITSM, equipping them with practical guidance, confidence and know-how to adopt and adapt the ITIL framework according to an organisation’s requirements. 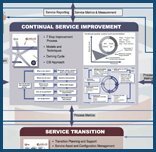 The course will benefit IT service management professionals who are ITIL Foundation-certified, who understand the global language of ITSM, and now want to learn how to adopt and adapt it in the workplace. In order to take the Practitioner examination, you must have already passed the ITIL Foundation exam. It is important to note that ITIL Practitioner is not a pre-requisite for intermediate levels.